You should also check out the advice from the SAS Institute website on learning paths, certification, dates and locations advising when and where courses are being run, and pricing. Tip to find course dates click on each course and the available course dates and locations are listed below. What background do you find that good analytics people come from and what qualifications do they need to have? Knoware: We tend to first look for people who can show that they have critical thinking skills. Therefore people with qualifications in the Social Sciences such as psychology, and sociology, or in Business such as economics, where they will have learnt critical thinking and have developed their understanding of how to use statistical modelling. These qualification are likely to be a Master’s degree or possibly a PhD depending on your career aspirations. People starting their career in analytics won’t have a great depth of practical experience or training, so I look for people who can show that they have good communication skills, such as writing, active listening and being able to express themselves well verbally whether one on one or in a larger group. People aspiring to progress to a senior analytics position, need to develop a diversity of practical experience. This is paramount because a senior analytics adviser needs the ability to explain the models and statistical techniques to the decision makers, and other interested people by using real world examples. This requires the ability to communicate through active listening, asking insightful questions, and being “clear and concise” in both oral and written communications. It is vital that you have the ability to present your thinking in terms your audience can understand and relate to. Can you explain more about what you mean by the diversity of industry experience they need to have? 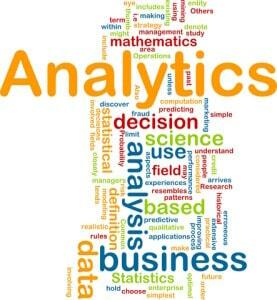 Knoware: The best analysts are those who have applied analytics across a myriad of situations. For a junior analyst, this might be in the form of papers covering different subject areas. A senior analyst working in the public sector will need to demonstrate experience in different government agencies. In the private sector it will be important to develop and show experience across different industries. Often people ask if someone with experience in the public sector can apply this in the private sector and vice versa. Initially it is not always easy to adapt from one to the other, however we suggest that this is more about how internal processes work in different organisations, than about the differences between private and public sectors. What SAS tools do I use for analytics work and how are they used ? Visual Analytics is one of the newest SAS tool and is used by business users carrying out first level analytics to get a good understanding of what information they have in their organisation and what it is telling them in a visual way. This tool enables innovation by the business users who are then able to more easily communicate the results and their analytics needs to more technical people. Office Analytics (formerly known as SAS Add-in to Microsoft Office) and Enterprise Guide are “point and click” graphical user interfaces that enable users to leverage the SAS statistical packages without coding. The main more technically orientated tool is called Enterprise Miner, there is also the Text Miner tool. These are heavy weight tools for carrying out in-depth and ongoing analytics work including developing and running sophisticated statistical modelling and predictive modelling, and in the case of Text Miner for analysing textual data rather than numerical data. What courses should I select to be able to develop my knowledge or use of analytics and statistics ? What will I be able to do after taking these courses ? Knoware: You will be able to work in any industry (private or public sector) and use your new analytic skills and SAS tools to answer most advanced analytical questions in areas such as predictive analytics, customer segmentation market message success. You can expect to be able to determine probabilities of default for banks or probability of application fraud for a government agency. You may also find it beneficial to make use of Knoware’s 1 – 2 – 1 coaching service to help ensure your success so that you don’t get stuck when tackling your first few assignments, or if you are getting back into use of SAS Enterprise Miner after some time away from regular use. What skill level do I need to be able to use Visual Analytics ? Knoware: This tool is designed for business users so you don’t need any particular technical skill to successfully use this tool. A basic understanding of statistical concepts is helpful and you may need some assistance to be able access your organisation’s information or data sets in order to commence your analysis. What skill level do I need to be able to use Enterprise Miner ? Knoware: You will need to have a good understanding of statistical concepts to successfully use this tool. What courses should I select to be able to use SAS tools for more in-depth analytics ? What other SAS courses might be useful to me ? Knoware: There is a range of other courses offered by SAS, most of which are for specific applications such as “economics forecasting”, “survey research”, “web analytics” and “in-bound / out-bound marketing”. These are all listed on the SAS Asia Pacific web site.